Nowhere are the challenges of a large urban high school more evident than they are at Central High School (CHS) in Newark, New Jersey. With more than 90% of the school’s 845 students eligible for free or reduced-price lunch, the school qualifies as “disadvantaged” under the U.S. Department of Education’s Title I guidelines. But try telling that to Vice Principal Lucinda Eason or to the approximately 160 students enrolled in Central High’s new Environmental Studies Academy. They are positive, engaged, and full of resolve to become “Guardians of the Earth.” They have filled the CHS grounds, classrooms, and hallways with green, living plants—signs of life, hope, and the ability to persevere in the face of difficulties, obstacles, and discouragement. The curriculum for the Environmental Studies Academy, an academic track inaugurated at CHS in the 2013-2014 school year, is designed to prepare a new generation of environmental leaders committed to leaving the world a better place for future generations. PLT’s GreenSchools Investigations are fully integrated into the Botany and Environmental Data Analysis course curricula and PLT’s GreenWorks grants have helped grow an urban gardening program that is flourishing on the school grounds and in two indoor greenhouses. 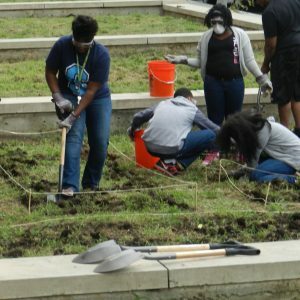 In addition to appreciating the beauty of plants and trees, Central High students gained a new awareness of the role plants play in removing harmful greenhouse gases like carbon dioxide from the air. Students studied which of three indoor plant species—golden pothos, fittonia, or dieffenbachia—was most efficient in removing CO2 from the air. They then lobbied administrators to place plants in classrooms and on hallway window ledges, convincing them that less CO2 would mean students would be less tired and more alert. The school’s two indoor greenhouses are used to raise the plants that help improve indoor air quality. Environmental Studies Academy students have also planted a sensory garden, a butterfly garden, and an urban vegetable garden on the school’s grounds, where student gardeners raise tomatoes, carrots, peppers, eggplant, and other vegetables for themselves and their families. 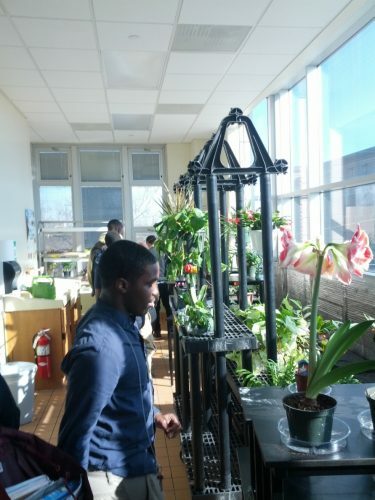 To fertilize their indoor and outdoor gardens, Central High students placed a compost bin in the cafeteria. Now, instead of sending uneaten food to the landfill, waste is turned into nutrients that help the school’s urban vegetable garden thrive. Porter and fellow sophomore Michael Faseun joined Vice Principal Eason and chemistry teacher Dr. Brian Kuzma in presenting a webinar about the GreenWorks grant program as part of a national “Climate Change LIVE” webinar series sponsored by the U. S. Forest Service and 26 federal and nonprofit partners, including Project Learning Tree. They explained how GreenWorks grants might support other schools that want to investigate and address climate change issues.